A dairy farmer all of his working life, Donald Armstrong was forced into early retirement in the 1980s because of poor health. After paying a visit to Percy Bezanson, a well known and highly respected carver of horses and oxen, Donald decided to try carving as a way of passing the time, and purchased some carving tools. Although he had never done any carving before that time, he discovered he had a natural ability to work with wood, and he has been carving ever since. Donald's favourite subjects are horses and oxen, and the farm machinery, carts and carriages pulled by them before the advent of motorized equipment. 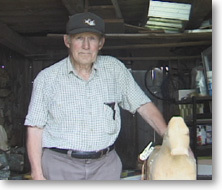 He prides himself on the authenticity and accuracy of his work, and has travelled extensively throughout the farming areas of Nova Scotia searching for old farm equipment to study and to use as models for his carvings. Donald is no longer selling any of his work but he continues to carve for his own pleasure. He has kept several of his best pieces for display in his workshop. Donald loves to receive mail from the people who purchased his work and you can contact him through his daughter Kathy DeNuke. Kathy owns and operates the Granvalley Bed & Breakfast which is located across the road from the original family homestead. Her web site address is www.granvalley.com. Click on image to enlarge and for pricing.